this is a post about salad, but before we dive into that kale goodness above lets talk about dining room tables. because it’s pretty much all i can think about. and if i harass lou about it any more we may end up in counseling. last night we cleared all of the miscallaneous crap out of the dining room that was lingering since the move (only 5 months later!) and hung all our art. when the dust settled i realized that the perfect table for our room is one i have spent years lusting over! it’s the saarinen tulip table (see it in spaces here and here). we picked up a vintage saarinen tulip side table years ago (for a steal because of a chip on one side that we happily cover up with a plant) and that white marble gem makes me happy every time i look at it, so can you even imagine my level of joy if we had 8 FEET OF IT IN OUR DINING ROOM!? i can, obviously. and how pretty does food look on marble? it tasted 40% better too (yes, i did eat off the side table. i have no shame). now we just need to stumble on one with a chip. preferably on the underside. that shaves about $6500 off the price. ok then. kale…. 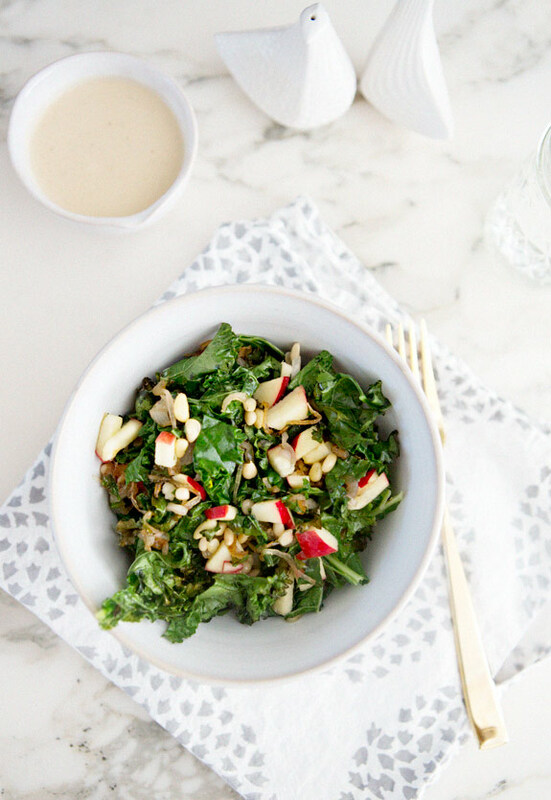 warm kale salad is so good for those days when you want to get something green and healthy in you but also crave the warmth of a cooked meal! this one is easy and perfect for a light and satisfying lunch. truth be told it’s not the prettiest (or at least my hastily thrown together one wasn’t), but it sure is tasty! one giant bunch of kale or 1 1/2 small/medium bunches 3 medium shallots 1/4 cup pine nuts 1 sweet apple (like pink lady) grape seed oil for the dressing: 3 tablespoons tahini 2 cloves garlic, minced juice of one lemon 1 tablespoon agave 1 tablespoon avocado oil (or other light oil) water sea salt the how: preheat over to 375 cut kale into large pieces, removing most of the stem toss in grape seed oil, sprinkle with sea salt, place on roasting sheets and set aside thinly slice shallots and start to caramelize in a well oiled frying pan on low/medium heat while the shallots are caramelizing chop the apple into tiny bits and place in a large serving bowl with the pine nuts keep an eye on the shallots- stir every once in a bit but give them time to brown and sweeten- lower your heat if they’re cooking too fast or burning! 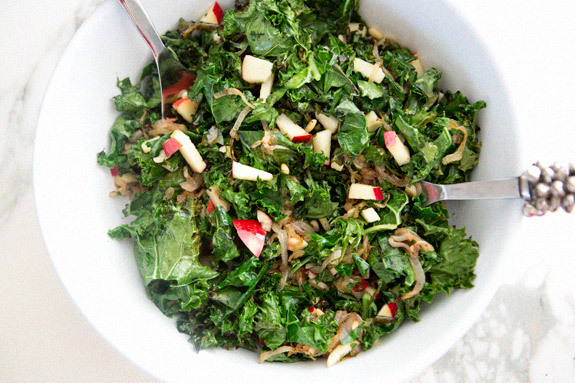 combine the dressing ingredients in a small mixing bowl – add water to thin the mixture to a dressing consistency you’re pleased with when you think the shallots are almost done it’s time to get that kale in the oven! cook it until it’s warmed through but remove before it gets too crispy on the edges. chop into smaller pieces and mix with shallots, apple and pine nuts. dress individually, and enjoy! Sounds delicious! Where did you get those adorable salt and pepper shakers? ok that is one of my all time favorite dining tables. so you should probably get it! and this salad looks delicious! 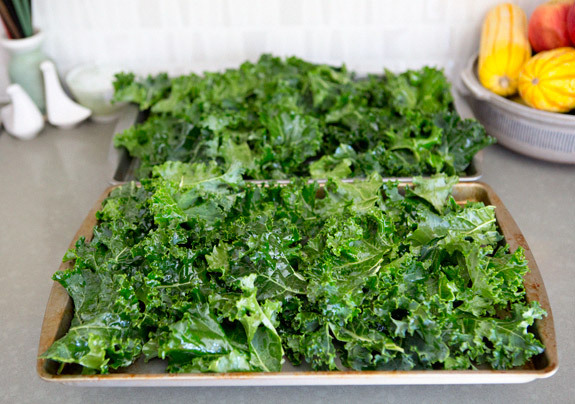 I had a bunch of kale in my hand last night at the grocery and could not get beyond kale chips when thinking about what to do with it. This recipe has me wishing I had picked it up anyway and considered my options later. Looks delish! My bf and I love kale in green smoothie. 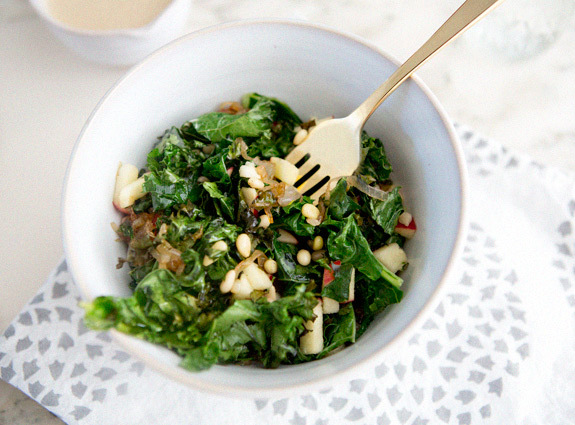 I'll have to try this kale salad! Looks delicious. Thanks for sharing. Braggs Amino Liquid, 1 TBL. Dress the salad and toss. If you have any left over (which is unlikely) it is great the next day! I always make extra because it is SOOOO good! I proceeded with a few tweaks: roasting the pine nuts, stretching the dressing with more lemon juice than water, adding some black pepper to the dressing, and tossing the apples in lemon juice (only because I have a hard time eating apples if they turn brown). With that being said, with the minor tweaks, I loved this salad! It had me feeling light on my feet and enjoying the deliciousness of super-whole foods. Thanks so much! i don’t usually comment, but i just had to thank you for how delicious this is! i truly only cooked it because i really needed a healthy dinner after some not-so-healthy takeaways, but then it was deceptively super delicious. like i think this might be my favourite salad now! thank you so much!